Malayalam /mÃ¦lÉËjÉ'ËlÉm/ (à´®à´²à´¯à´¾à´³à´, MalayÄá¸·amÂ ? 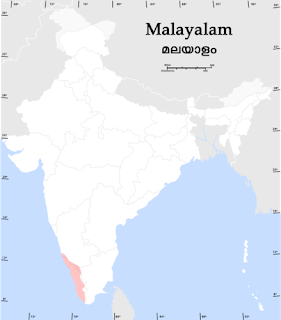 [mÉlÉjaËÉ­Ém]), is a language spoken in India, predominantly in the state of Kerala. It is one of the 22 scheduled languages of India and was designated a Classical Language in India in 2013. Malayalam has official language status in the state of Kerala and in the union territories of Lakshadweep and Puducherry. It belongs to the Dravidian family of languages and is spoken by some 38 million people. Malayalam is also spoken in the neighboring states of Tamil Nadu and Karnataka; with more populace in the Nilgiris, Kanyakumari and Coimbatore districts of Tamil Nadu, and the Dakshina Kannada and Kodagu districts of Karnataka. The Malabar Tamil Chera Dynasty of Kerala came to an end in Kerala in 1102. Southern Kerala (Chengannur to Kanniyakumari) was part of the Pandyan Kingdom and Tamil was the official language of Kerala until 1102. After the fall of Villavar Tamils in 1310 after the attack of Delhi Sultanate under Malik Kafur, Kerala was dominated by Tulu-Western UP people who were migrants from Ahichatra who used Sanskrit and Prakrit. Many subcastes of Tulu Bunt such as Nayara, Menava, Kuruba and Samantha appeared in Kerala.Samanthas became the Kings of this Matriarchal society. Still the Indigenous language of Kerala Malayanma otherwise called Malayalam or Malayalam-Tamil or Malayala Thamozhi or Lingua Malabar Tamul continued to be used until 1820. Grantha Bhasa, which was used exclusively by Namputhiri Brahmins of Kerala which contained 80 percent Sanskrit and few Malayalam words. Grantha Bhasa was used by migrants from Ahichatra which was written using a form of Tulu Script called Tigalari Script.Tulu-Grantha Bhasa had its origin at Karnataka where Sanskrit books were written using Tigalari alphabet. Grantha Bhasa was used exclusively by Nambuthiris who were less than 0.3 percent of the population. Adhatyamia Ramayanam is the first book to use Tulu-Malayalam Script or Tigalari Script. Grantha-Malayalam books written by Nambuthiris in that era contained more than 80 percent Sanskrit and less than 20 percent Malayanma words. Grantha Bhasa used Sanskrit Grammar instead of Malayanma grammar.Grantha Bhasha had less than 10 books until the 19th century. The discovery that Sanskrit was closely related to German led missionaries of German origin such as Arnos Pathiri (Johann Ernst Hanxleden) to show interest in Grantha Bhasa.Johann Ernst Hanxleden wrote Grantha Bhasayude Vyaharanam in 1699 first ever Grammar book in Grantha Bhasa. The earliest known poem in Malayalam, Ramacharitam, dated to the 12th century A.D., was completed before the introduction of the Sanskrit alphabet. It shows the same phase of the language as in Jewish and Nasrani Sasanas (dated to midâ'8th century A.D.). But the period of the earliest available literary document cannot be the sole criterion used to determine the antiquity of a language. In its early literature, Malayalam has songs, Pattu, for various subjects and occasions, such as harvesting, love songs, heroes, gods, etc. A form of writing called Campu emerged from the 14th century onwards. It mixed poetry with prose and used a vocabulary strongly influenced by Sanskrit, with themes from epics and Puranas. Dr. Hermann Gundert, (1814 â" 1893), a German missionary and scholar played a distinguishable role in the development of Malayalam literature. His major works are Keralolpathi (1843), Pazhancholmala (1845), Malayalabhaasha Vyakaranam(1851), Paathamala (1860) the first Malayalam school text book, Kerala pazhama(1868), the first Malayalam dictionary (1872), Malayalarajyam(1879)-Geography of Kerala, Rajya Samacharam (1847 June) the first Malayalam news paper, Paschimodayam (1879)-Magazine. He lived in Thalassery for around 20 years. He learned the language from well established local teachers Ooracheri Gurukkanmar from Chokli, a village near Thalassery and consulted them in works. He also translated The Holy Bible into Malayalam. The progress of literature in the Cochin and Malabar areas during this period was influenced by the advancement of English education in these regions. The educational activities of the missionaries belonging to the Basel Mission deserve special mention. It was under their auspices that Dr Gundert, a German missionary of exceptional linguistic talents, produced by his own personal effort the Malayalamâ"English Dictionary, which even today remains an authoritative work. A priest George Mathan wrote the first authoritative grammar book in Malayalam titled Malayanmayude Vyakaranam. Thanks to the efforts of kings like Swathi Thirunal and to the assistance given by him to the Church Mission and London Mission Societies, a number of schools were started. */É¨Ì/ is the saá¹vrÌ¥tÅkÄram, an epenthentic vowel in Malayalam. Therefore, it has no independent vowel letter (because it never occurs at the beginning of words) but, when it comes after a consonant, there are various ways of representing it. In medieval times, it was just represented with the symbol for /u/, but later on it was just completely omitted (that is, written as an inherent vowel). In modern times, it is written in two different ways â" the Northern style, in which a chandrakkala is used, and the Southern or Travancore style, in which the diacritic for a /u/ is attached to the preceding consonant and a chandrakkala is written above. ), but they are distinct vowels. Malayalam has also borrowed the Sanskrit diphthongs of /Ã¤u/ (represented in Malayalam as à´", au) and /ai/ (represented in Malayalam as à´, ai), although these mostly occur only in Sanskrit loanwords. Traditionally (as in Sanskrit), four vocalic consonants (usually pronounced in Malayalam as consonants followed by the saá¹vrÌ¥tÅkÄram, which is not officially a vowel, and not as actual vocalic consonants) have been classified as vowels: vocalic r (à´, /rÉ¨Ì/, rÌ¥), long vocalic r (àµ , /rÉ¨Ë/, rÌ¥Ì), vocalic l (à´, /lÉ¨Ì/, lÌ¥) and long vocalic l (àµ¡, /lÉ¨Ë/, lÌ¥Ì). Except for the first, the other three have been omitted from the current script used in Kerala as there are no words in current Malayalam that use them. The unaspirated alveolar plosive stop once had a separate character but it has become obsolete, as the sound only occurs in geminate form (when geminated it is written with a à´± below another à´±) or immediately following other consonants (in these cases, à´± or à´±à´± are usually written in small size underneath the first consonant). The archaic letter can be found in the â¨á¹¯â© row here . The alveolar nasal also had a separate character that is now obsolete (it can be seen in the â¨á¹â© row here ) and the sound is now almost always represented by the symbol that was originally used only for the dental nasal. However, both sounds are extensively used in current colloquial and official Malayalam, and although they were allophones in Old Malayalam, they now occasionally contrast in gemination â" for example, eá¹á¹Äl ("by me", first person singular pronoun in the instrumental case) and ennÄl ("if that is so", elided from the original entÄl), which are both written ennÄl. The letter à´« represents both /pÊ°/, a phoneme occurring in Sanskrit loanwords, and /f/, which is mostly found in comparatively recent borrowings from European languages. Malayalam numbers and fractions are written as follows. These are archaic and no longer commonly used. Note that there is a confusion about the glyph of Malayalam digit zero. The correct form is oval-shaped, but occasionally the glyph for Â¼ (àµ³) is erroneously shown as the glyph for 0. Malayalam has a canonical word order of SOV (subjectâ"objectâ"verb) as do other Dravidian languages. Both adjectives and possessive pronouns precede the nouns they modify. Malayalam has 6 or 7 grammatical cases. Verbs are conjugated for tense, mood and aspect, but not for person, gender or number except in archaic or poetic language. Masculine Sanskrit nouns with a word stem ending in a short /a/ take the ending /an/ in the nominative singular. For example, KrÌ¥á¹£á¹a â' KrÌ¥á¹£á¹an. The final /n/ is dropped before masculine surnames, honorifics, or titles ending in /an/ and beginning with a consonant other than /n/ â" e.g., "Krishna Menon", "Krishna Kaniyaan" etc., but "Krishnan Ezhutthachan". Surnames ending with /ar/ or /aá¸·/ (where these are plural forms of "an" denoting respect) are treated similarly â" "Krishna Pothuval", "Krishna Chakyar", but "Krishnan Nair", "Krishnan Nambiar", as are Sanskrit surnames such "Varma(n)", "Sharma(n)", or "Gupta(n)" (rare) â" e.g., "Krishna Varma", "Krishna Sharman". If a name is a compound, only the last element undergoes this transformation â" e.g., "KrÌ¥á¹£á¹a" + "dÄ"va" = "KrÌ¥á¹£á¹adÄ"van", not "KrÌ¥á¹£á¹andÄ"van". Feminine words ending in a long /Ä/ or /Ä«/ are changed to end in a short /a/ or /i/, for example "SÄ«tÄ" â' "SÄ«ta" and "Laká¹£mÄ«" â' "Laká¹£mi". However, the long vowel still appears in compound words, such as "SÄ«tÄdÄ"vi" or" Laká¹£mÄ«dÄ"vi". The long Ä« is generally reserved for the vocative forms of these names, although in Sanskrit the vocative actually takes a short /i/. There are also a small number of nominative /Ä«/ endings that have not been shortened â" a prominent example being the word "strÄ«" for "woman". Nouns that have a stem in /-an/ and which end with a long /Ä/ in the masculine nominative singular have /vÅ­/ added to them, for example "BrahmÄ" (stem "Brahman") â' "BrahmÄvÅ­". When the same nouns are declined in the neuter and take a short /a/ ending in Sanskrit, Malayalam adds an additional /m/, e.g. "Brahma" (neuter nominative singular of "Brahman") becomes "Brahmam". This is again omitted when forming compounds. Words whose roots end in /-an/ but whose nominative singular ending is /-a-/ (for example, the Sanskrit root of "karma" is actually "karman") are also changed. The original root is ignored and "karma" (the form in Malayalam being "karmam" because it ends in a short /a/) is taken as the basic form of the noun when declining. However, this does not apply to all consonant stems, as "unchangeable" stems such as "manas" ("mind") and "suhrÌ¥t" ("friend") are identical to the Malayalam nominative singular forms (although the regularly derived "manam" sometimes occurs as an alternative to "manas"). Sanskrit words describing things or animals rather than people with a stem in short /a/ end with an /m/ in Malayalam. For example,"RÄmÄyaá¹a" â' "RÄmÄyaá¹am". In most cases, this is actually the same as the Sanskrit accusative case ending, which is also /m/ (or, allophonically, anusvara due to the requirements of the sandhi word-combining rules) in the neuter nominative. However, "things and animals" and "people" are not always differentiated based on whether or not they are sentient beings; for example, "Narasimha" becomes "Narasiá¹ham" and not "Narasiá¹han", whereas "Ananta" becomes "Anantan" even though both are sentient. This does not strictly correspond to the Sanskrit neuter gender, as both "Narasiá¹ha" and "Ananta" are masculine nouns in the original Sanskrit. The original Sanskrit vocative is often used in formal or poetic Malayalam, e.g. "HarÄ"" (for "Hari") or "PrabhÅ" (for "Prabhu" â" "Lord"). This is restricted to certain contexts â" mainly when addressing deities or other exalted individuals, so a normal man named Hari would usually be addressed using a Malayalam vocative such as "HarÄ«". The Sanskrit genitive is also occasionally found in Malayalam poetry, especially the personal pronouns "mama" ("my" or "mine") and "tava" ("thy" or "thine"). Other cases are less common and generally restricted to the realm of Maá¹ipravÄá¸·am. Along with these tatsama borrowings, there are also many tadbhava words in common use. These were incorporated via borrowing before the separation of Malayalam and Tamil. As the language did not then accommodate Sanskrit phonology as it now does, words were changed to conform to the Old Tamil phonological system, for example "KrÌ¥á¹£á¹a" â' "Kaá¹á¹an". Most of his works are oriented on the basic Malayalam family and cultures and many of them were path-breaking in the history of Malayalam literature. Malayalam script consists of a total of 578 characters. The script contains 52 letters including 16 vowels and 36 consonants, which forms 576 syllabic characters, and contains two additional diacritic characters named anusvÄra and visarga. The earlier style of writing has been superseded by a new style as of 1981. This new script reduces the different letters for typesetting from 900 to fewer than 90. This was mainly done to include Malayalam in the keyboards of typewriters and computers.